Neurons are the nerve cells in charge of nerve impulse transmission. Neurons communicate with other neurons trough special contacts called synapses. Neurons also communicate trough synaptic contacts with other cells in the body like muscle cells or glandular cells. Depending of their location in the different parts of the nervous system and their specific function, neurons showed distinct and complicated morphologies. Neuronal circuits and neurotransmitters released in the synapses are the basis of our thinking, feelings, memory, the voluntary movements of our body and also the involuntary control of our digestive or respiratory systems. In addition to neurons, other cells called glial cells are found in the nervous system. The number of glial cells is 10 times higher that the number of neurons. Although glial cells do not contribute to neuronal circuitry, they play important functions regulating neuronal functions, for instance controlling neurotransmitter production, synapses formation and the homeostasis of nervous tissue. In the central nervous system, the different types of glial cells, including astrocytes, ependymocytes, oligodendrocytes and microglial cells characteristically display nice fascinating ramified morphologies that may change depending of their activation state. In the last past years, many research laboratories around the world have focused their studies on the biology of glial cells in order to understand the role they are playing protecting the neurons from diseases and regulating the immune responses affecting the nervous system. 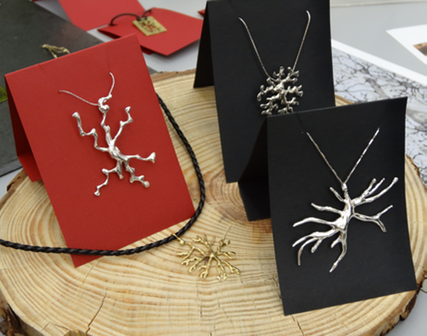 Stylized jewelry designs based on the intricate morphology displayed by the cells of the nervous system: neurons, astrocytes, oligodendrocytes, ependymocytes and microglia. This is the place where you will find the original gift you are looking for. 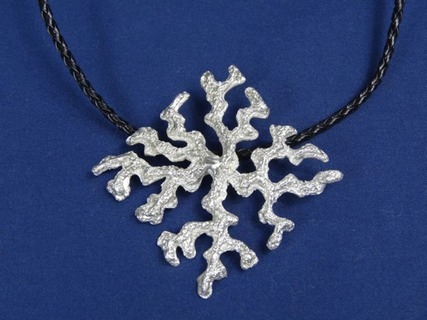 Necklaces, earrings, bracelets, rings, pendants and brooches in sterling silver or gold. Choose the jewel and metal that best suits your style. Original designs that can not be found anywhere else.